If you’re waiting for the days of a “toll-free” mobile internet, you may not have to wait much longer. Speaking at a Morgan Stanley investor conference on Wednesday, AT&T(s t) Chairman and CEO Randall Stephenson said he anticipates content providers and app developers will soon start paying the network freight for their content, FierceWireless reported. 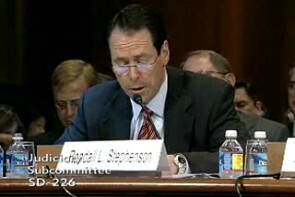 Content providers could do this through direct payments to carriers, Stephenson said, but according to Fierce, he also said they could subsidize data costs through some kind of advertising revenue share. The end result, though, would be the same: content providers who pay would see their traffic exempted from customers’ mobile data caps. Stephenson comments come a week after reports that arch-competitor Verizon Wireless(s vz)(s vod) is in discussions with ESPN(s dis) for just such a toll-free data deal. What seemed like a crazy suggestion from AT&T and other carriers last year, now looks like it might become reality. But is it a reality we really want? A content provider-subsidized internet would be appealing to many consumers, especially those on AT&T and Verizon since carriers have hunted the unlimited data plan to the point of extinction. Imagine streaming Netflix(s nflx) movies and ESPN games to your heart’s content without ever worrying about exceeding your data cap or incurring overage fees. … there are enormous consequences to such a deal. The biggest and most obvious consequence is that it favors one provider’s content over another. If all access is created equal, then no content has an inherent advantage over another — which is the whole idea behind the wireline network neutrality rules the FCC established in 2010. But if consumers know they can get ESPN’s content without incurring any additional charge, they’ll naturally gravitate toward that content. There’s an even bigger risk that ESPN’s competitors won’t just get penalized in the eyes of the consumer. Their traffic flow could be penalized as well. Embedded deep within Verizon’s network are policy servers that can distinguish an ESPN packet from any other packet. Not only could Verizon use that technology to exempt ESPN traffic form data plans, it also could use that technology to prioritize ESPN’s traffic from all others. The [Wall Street] Journal’s story didn’t mention anything about traffic shaping, but you can bet its high on the list in any negotiation. What’s particularly noteworthy about Stephenson’s comments, though, is the mention of using advertising as a former of subsidy currency. Stephenson could just be talking about inserting carrier-generated advertising into their app ad engines as compensation for their free ride on the network. But the other implication is that AT&T wants a true revenue share, taking a cut off the top of any revenue generated from YouTube(s goog) ads or any Netflix subscription used on mobile. This is an old idea the mobile industry first proposed way before the advent of the smartphone – in an age when the mobile internet was still a walled garden and carriers its gatekeepers. The idea was that operators would become equal partners with content providers, and that’s a scary proposition. I doubt that content providers want to give the gate keys back to the carriers.